Conclusion: This systematic review summarizes the medical literature for risk prediction models for delirium in hospitalized older patients. We will use this information to develop an EHR-generated delirium risk prediction model to be used by the "Hospital Elder Life Program" to reduce incidence of delirium. Kalmisetty S, Askar W, Fay B, Khan A. Models for predicting incident delirium in hospitalized older adults: a systematic review. 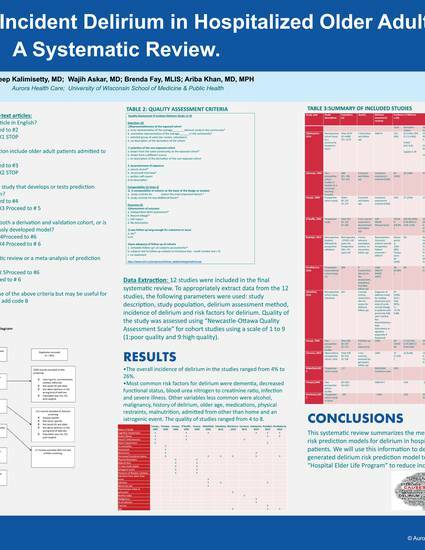 Poster presented at: Aurora Scientific Day; May 25, 2016; Milwaukee, WI.